When we were in Hawaii recently, a friend shared the details of his relatively recent shark attack. (Please do not reveal his name on replies if you guys know him. He has asked for privacy.) It was totally horrific - he came within inches of death and was hospitalized for over a month. Within an hour of his story we were in the ocean diving with him. I took my first night dive in the ocean off Honolulu an hour after I saw JAWS for the first time in 1976. I was a younger man then and impulsive and was definitely looking around for the great beasts. But this weekend, diving alongside a man who was seriously attacked, it was a wholly different story. I am not as young as I was and not so much impulsive. The dive in broad daylight was far more intense than the night dive off Waikiki beach. I have been diving in this very spot for hundreds of hours and knew that this was definitely NOT a haven for sharks, but having just heard his story I was definitely looking around. I know the statistics for shark attacks is lower than being struck by lightning – UNLESS – you live in Florida, that is. And nearly all shark attacks occur in water you can stand up in and most bites are relatively minor leg and ankle bites (ie – surfing injuries). But I also remember the photo that some of my environmental management colleagues took from the air off launch pad 39A. There were countless sharks in the photograph – about one shark every 50 feet or so. Not all sharks are killers and man-eaters. But all sharks have to eat. They are not known for their intelligence and probably have no idea what a man is, much less swim around and dream up plots against him. But when man encounters shark – it is entirely up to the shark to do whatever he – or they – are going to do. The shark has very sensitive sensors on its nose. It can detect activity in the water long before it sees its prey and far in advance of the prey seeing the shark. The good news is that sharks apparently do not like the taste of humans. That is why my friend was not killed. Swimming off the Honolulu Boat Harbor about half a mile out, the shark just ‘tasted’ him and left. In a single instant, the shark clung to his abdomen with its rear teeth. Held him with the back teeth and then took two severing bites with its top teeth in less than half a second. He felt no pain. He thought he had collided with a log. He stood upright in the water and reached his hand out for the ‘log’ and felt the nose of a huge shark. It was at that moment that he saw the ocean around him was ‘purple’. The he felt the huge flap of skin that used to be on his back fold around his arm. The shark turned and left. But he was a half mile out in the ocean bleeding profusely with half his back hanging loose in the water. It was nothing less than a miracle that he survived, and one key part of the miracle is that he apparently didn’t taste very good to the great beast. As we look forward to longer periods in the water, the site we have selected for the Atlantica I expeditions is also a breeding site for the Bull shark – one of the most aggressive sharks in the world. 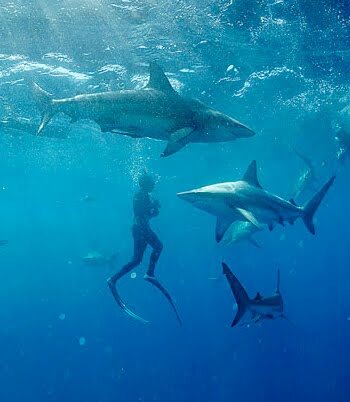 We will definitely seek more training on diving in those waters from shark experts and diving in and around the habitat will be done with special attention to the activities and behavior characteristics of the rather mean-spirited Bull shark. Having said all that, we also recognize that our activities are in its waters where it has lived for countless millennia. We are the observers, not the conquerors. We are the scientists there to observe it in its element and we are most definitely not there to remove or injure a single shark. If anything, we wish to study them and count them and understand how the activities of man are encroaching on their habitat. In so doing, we hope to make life easier on them and thereby encourage them to achieve their ultimate balance in the aquatic realm where we have presumed to join them.